I hadn’t been a fan of Kerry Washington’s two previous looks, but she sure knows how to make me fall in love again. She arrived on the red carpet wearing a flesh coloured Zuhair Murad Spring 2009 gown, covered in navy blue floral embellishments and a velvet navy ribbon. We’ve seen this silhouette a lot at Cannes, but her floor-sweeping fishtail tulle train added to the overall glamour of the look. Her bouffant was bouncy with beautiful tumbling curls, whilst her make-up kept light. Myleene Klass wore a very similar version of this gown last week. Charlotte Gainsbourg won the best actress prize at the Cannes Film Festival last night for her role as a grieving mother in the film ‘Antichrist’. She arrived at this premiere with her husband wearing a gold studded Balenciaga Resort 2009 shortened dress, which she wore with black strappy Balenciaga heels. I love her carefree approach to fashion. Asia Argento has had a fantastic run on the red carpet at Cannes, and it seems her preferred collections were from Roberto Cavalli and Armani Privé. She picked another outstanding Armani Privé Spring 2009 gown for this premiere. It had a sculptural detail on the shoulder and the skirt, which then trails off into a stunning train. Her heels compliment the gown, and I love the print which lines inside of this magnificent gown. Georgina Chapman wore a satin-faced silk organza dress from her Marchesa Spring 2009 collection, which is architecturally pleated to dramatic effect but it looks slightly flat whilst standing so close too her husband. Satin Louboutin’s complete the look. 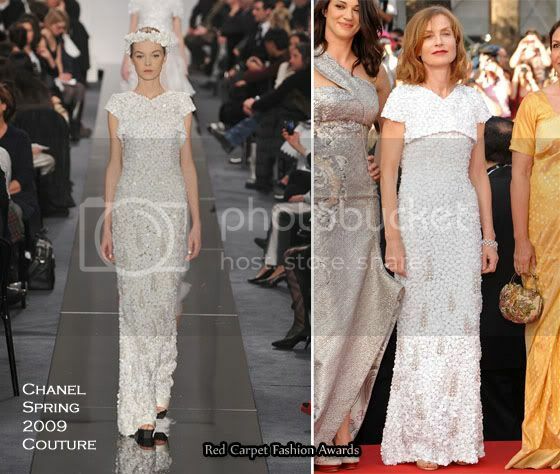 Isabelle Huppert and Asia, will have to fight it out for the honour of ‘Queen of Couture’ at this years Cannes Film Festival. Both have worn such magnificent pieces. Isabelle has worn some cutting edge and risqué pieces, but on this occasion she opted for a Spring 2009 Chanel Couture gown which was so elegant, delicate, and sophisticated. Zhang Ziyi looked like a fairytale princess in this wonderful blush pink paillette covered gown, which was cut very low at the back. Her gown was paired with a silver clutch, and she may have been inspired Paris Hilton as she wore a jeweled hair accessory. When I saw Robin Wright Penn wearing this shimmering sheer black gown, the first person to come to mind was Sharon Stone. Shu Qi’s blue one-shouldered Roberto Cavalli gown was embellished around waist, and on the shoulder strap with black crystals. Her sapphire blue earrings and ring, complimented her gown beautifully. Anna Mouglalis wore an eye-catching green satin gown, with an exaggerating bow, as she smoldered for the cameras.